The Kellogg-Sasin alliance began in 1982 through the efforts of leaders from both schools. 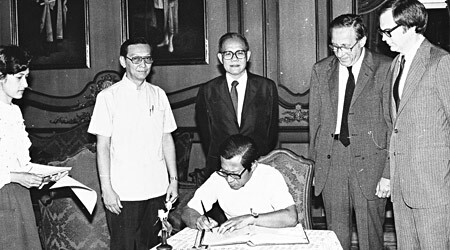 Standing from left: Sasin's Suthi Ekahitanonda, deputy director; Toemsakdi Krishnamra, director; Kellogg Dean Donald P. Jacobs and Professor Robert Duncan witness Chulalonghorn University President Khun Kasem signing the joint agreement between the schools. What began in snow 25 years ago has blossomed into a splendid and enduring relationship. The academic partnership between Kellogg and the Sasin Graduate School of Business Administration at Bangkok's Chulalonghorn University has been a mutually successful one. In August, the school marked a quarter-century of extraordinary leadership with a gala event that included visits from Kellogg Dean Dipak C. Jain and Dean Emeritus Donald P. Jacobs, who joined Sasin Director and Professor Toemsakdi Krishnamra in Bangkok to celebrate. The three were honored during a dinner ceremony at Sasin that brought together administrators, faculty members, alumni and students from the past 25 years of the alliance. The evening also featured a musical program played by the Sasin Mahori Ensemble and the Thailand Philharmonic Orchestra. In addition, MBA students showed their gratitude to the three deans by performing the traditional Wai Kru ceremony, a ritual to convey deep respect. Kellogg Dean Emeritus Jacobs recalled the start of this relationship. "Kellogg needed more knowledge about Asia, so the opportunity to send our faculty there [in the 1980s] was very important," he said. "But because Kellogg didn't have the reputation it now enjoys, you could say we each took a risk on the other." Indeed, the partnership began somewhat inauspiciously, with a cold call to Evanston by Krishnamra and Associate Professor Suthi Ekahitanonda in November 1981. The weather was bitter and the two Chulalonghorn representatives showed up at Jacobs' door with a request to work together with Kellogg in building an MBA curriculum in Thailand. Jacobs remembered having little time that day for this unscheduled, and somewhat dubious, appointment, so he excused himself. The visitors, however, would not give up so easily. After spending a freezing night in an Evanston hotel whose faulty window allowed the wind to carry snow into the room, they returned to Jacobs early the next morning to renew their appeal. This time, the dean listened. "What finally convinced me was their persistence," he remembered. "They really knew what they wanted out of the program and partnership, and were clear about expressing it." On May 28, 1982, Kellogg and Sasin formally began their alliance to create the first English-speaking MBA program in Thailand. Since then, Sasin has distinguished itself as the country's leader in graduate business education, recently ranked among the top 10 business schools in Asia. Over its history, nearly 3,000 students have gone through the programs, which evolved to include part-time and executive offerings before the end of the 1980s. Said Director Toemsakdi at the August celebration: "For the first 20 years of Sasin, Dean Jacobs acted as the school's godfather, giving advice, showing us the way to build our institution. Had it not been for his foresight and wisdom, Sasin would not have gained its global standing today." He also praised the continued leadership of Dean Jain, who he said "pushed Sasin up to another height," including through his administrative advice and his dedicated teaching in courses every year since 1989. Dean Jain said the alliance between the schools keeps growing stronger and he anticipates a "continued dedication to academic excellence as partners together in this wonderful journey." This year also marked the 10th anniversary of the Kellogg School's joint-degree executive MBA partnerships in Asia and Europe. Celebrations in Hong Kong and Germany highlighted the accomplishments of the alliances Kellogg has with the Business School at the Hong Kong University of Science and Technology (HKUST) and the WHU-Otto Beisheim School of Management in Vallendar, Germany. The Kellogg School's joint-degree EMBA program with the Recanati Graduate School of Business at Tel Aviv University celebrated its 10-year anniversary in 2006. Today, the alliance between Kellogg and Sasin continues. Marking 25 years of the partnership during an August celebration were (from left): Kellogg Dean Emeritus Donald P. Jacobs; Sasin Professor Toemsakdi Krishnamra; Mrs. Saichitr Krishnamra; Wiwan Tharahirunchote '85, managing director of Kasikorn Asset Management; Kittiratt Na-Ranong, Sasin deputy director for academic affairs; and Kellogg Dean Dipak C. Jain.